We got another small round of cases in the store today. We’re taking holds and this is the last time we’ll see this one. 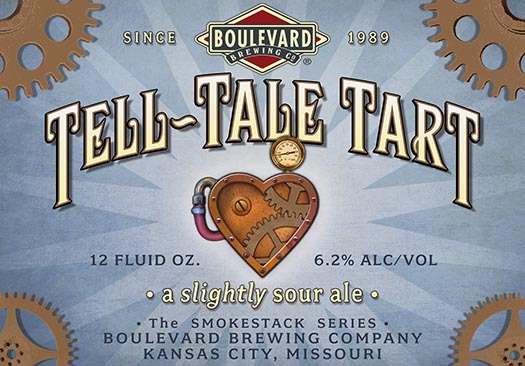 Deriving its name from Poe’s classic tale of madness and murder, Tell-Tale Tart takes a lighthearted approach to the subject of sourness. Subtle acidity is answered by a soft malt character, making this a sour ale that suggests, rather than announcing its tartness. An Old-style German wheat ale with a short lactic fermentation. Light and crisp with an acidic sour bite that aims to please. Traditionally served with raspberry or woodruff syrup, but can be enjoyed without. 60% wheat and 40% barley. Fermented with German Weizen yeast and Lactobacillus at 75 degrees Fahrenheit (23.9 Celsius). Originally this version was available for the American market, while in Europe a version less sour was available; as of today, only this version of Sour is produced, so if you got a recent vintage you had this one. The Sour has a sticker to differenciate it from the sticker-less Barriquée Mild, which has not been inoculated with lactobacillus bacteria.